For techies and phone geeks, Digital Cambodia 2019 was the place to be. The discussions focused on 5G, which, with speeds as much as 100 times faster than 4G, will mean better soccer viewing for Hak Kimheng and faster connections for all users. But 5G will also be central to a world of smart cities filled with smart homes and offices replete with devices connected to the “internet of things” humming along amid torrents of personal, business and official data. 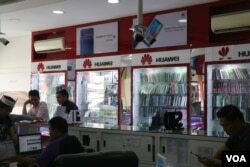 Government ministers, one from finance and economy and one from posts and telecommunication, listened as Li continued, pointing out that Huawei Technologies Cambodia launched in 1999. “We have been operating 2G, 3G, 4G, and now we’re heading toward 5G,” he said. “Currently we are the only industry vendor that can provide the intertwined 5G system. I believe this year 2019 will be a milestone year for 5G in Cambodia,” Li said. “And the question will be to what extent is that concern enough to overcome the price advantage and the service advantages and the integrated financing advantages doing business with Huawei,” he said. FILE - A man looks at his smartphone at a coffee shop in Phnom Penh, Cambodia, Oct. 23, 2018. Tram IvTek, Cambodia’s minister of Posts and Telecommunications said at the opening ceremony of Digital Cambodia that the government “is strongly committed to connecting the country and to ensure the benefits of ICT (information and communications technology) reach the remotest corners as well as the most vulnerable communities” by 2020. “Cambodian youths don't really care about privacy [on social media], but people in [the] EU are concerned about their data privacy,” said Somaly, referring to the European Union’s General Data Protection Regulation (GDPR) which restricts how personal data is collected and handled. Xu Ning, a reporter with VOA's Mandarin Service, contributed to this report from Washington, D.C.